The only way to have veal shanks is fall-off-the-bone tender, complemented with a mouth-watering white wine sauce created using Knorr Napoli. Served with perfectly prepared risotto, the melt-in-your mouth meat and luscious marrow is the perfect way to indulge your guests. Season the veal shanks with salt and pepper. Fry the shanks in vegetable oil until golden brown. Remove the shanks and fry the onions, garlic and carrot. Add Knorr Napoli Tomato Sauce and Knorr Demi Glace. Add the sauce to the shanks and vacuum seal in a vacuum bag. Prepare sous-vide for 6 hours at 85°C. Take the shanks out of the bag and keep them warm. Blend the sauce, sieve and season with salt and pepper to your desired taste. Cut the tomatoes and dry them on a low temperature (80°C) in the oven until they are half dried. Fry the chopped shallots in olive oil without colouring. Add the rice and fry lightly for 2 minutes. Add the vegetable bouillon in small amounts. Stir on a low fire. When the bouillon is soaked into the rice and the rice is “al dente”, add the butter and the parmesan cheese. Chop the parsley and garlic. 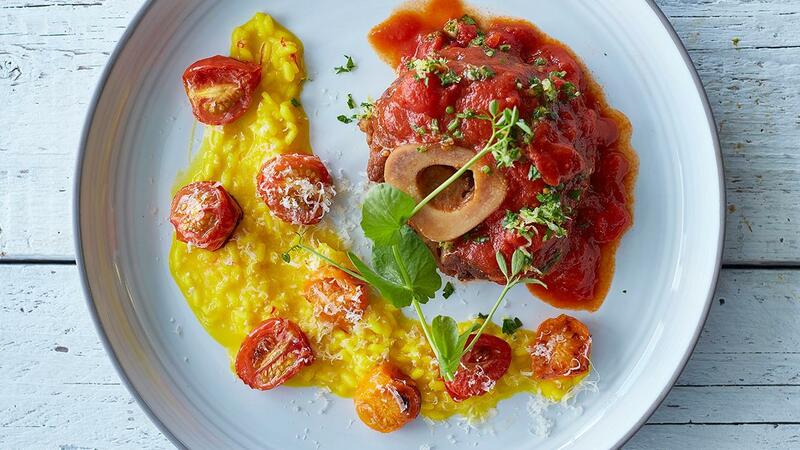 Put the veal shank on a warm plate and cover it with the tomato sauce.